Using Resharper's structural search and replace to find usages. There isn't much documentation on Resharper's Structural Search and Replace (SSR) so here is 2 such ways you might find it useful. If you use Find Usages (Shift F12) you get all usages of any inheritor of System.Windows.Forms.Control which isn't what we want in this case. but this only works in this instance because Text is overridden by System.Windows.Form. 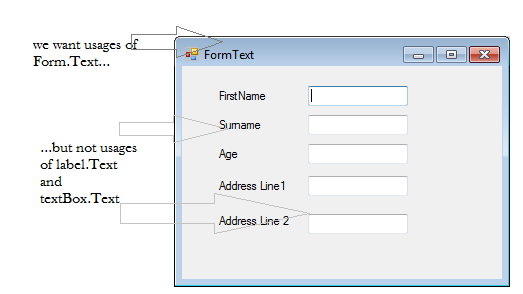 Consider a property of Form that isn't overridden (eg form.Font) - your only option here is to use SSR. Search with pattern to the rescue again! This returns only the one usage above instead of 4 usages using F12. Important! Make sure when specifying the type of $list$ that you specify the fully qualified class name eg List<ExampleApp.Person> - on that note it appears Resharper is showing the < and > characters as their escaped versions in the UI which is a display-only thing. Part II will cover an example of finding usages and replacing them with a predefined template. Just great! thanks for the information. A very good practical post. I did not know this feature, but can surely see myself using it. This makes me curious about learning more - what are the other possible placeholders (Statement, Type, Identifier) and how they may be used. Search pattern feature in resharper rocks. I know something like that we already have in Visual Studio, but this is more powerful.